Item: no. mocts500 15 lb. Item: no.mocts720 20 lb. High-end graphics users, professional Web designers and gamers will appreciate the choice provided by the VS-190. 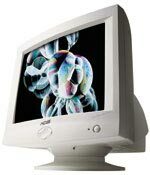 Larger than a 17-inch monitor, but more affordable than a 21-inch, it displays razor-sharp text, crystal-clear images and better-than-life color reproduction for applications ranging from DTP and CAD/CAM to advanced imaging and high-speed interactivity. The VS-190i is fully protected under KDS' exclusive KARES program, insuring peace of mind in addition to excellent performance. The 17" XF-7t is the ideal choice for those who want to take advantage of a flat screen monitor cased in a sleek silver and gray design. This high-performance display also features a maximum resolution of 1280x1024 @60Hz and an ultra-fine 0.22mm horizontal dot pitch making it an excellent choice for handling intense graphic applications, gaming and advanced spreadsheets. Item: no. lb. Item: no. moused 35 lb.